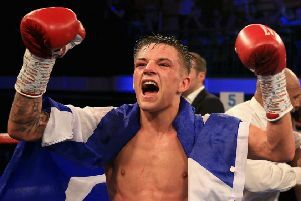 It has been a whirlwind 18 months for Edinburgh undefeated bantamweight Lee McGregor. Not only has he taken to the professional ring like a duck takes to water, but the 21-year-old is preparing to welcome his baby daughter into the world in four weeks’ time. The tide is finally beginning to turn for the 21-year-old, who lost his mum Elizabeth and both his grandparents last year, McGregor having previously revealed he had used boxing as a coping mechanism to help with the grief. 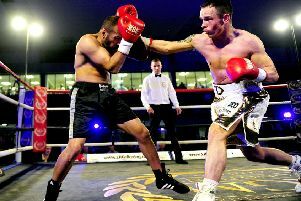 His biggest boxing triumph to date arrived in the summer when, in just his fourth bout, McGregor was crowned IBF world youth champion with a fourth-round stoppage of Tanzania’s Goodluck Mrema in Glasgow. He now has the opportunity to add another belt to his collection when he faces off against former Olympian Thomas Essomba of Cameroon for the vacant Commonwealth title at London’s York Hall on Saturday night. However, Essomba, nine years his senior, is no pushover, by any means. “He’s a very good fighter and is very strong,” McGregor, a stablemate of Prestonpans puncher Josh Taylor, told the Evening News. “He’s a tough man. I’m a young 21-year-old and still have a lot of developing to do; he is a fully grown man so I will need to use my head. He’s got the power to knock me out. He’s done it before so he has the ability to do it again. “But I believe I will break him down eventually, although it certainly won’t be like my previous fights where I’ve just blasted them out. I need to be more clever. It might go late but I kind of want that chance to show people exactly what I’m about. It’s just about keeping sharp now. “[My] Camp has been really hard. There’s been extra rounds of sparring, sprints – just everything has been stepped up a notch. No stone has been left unturned but I feel the fittest I’ve been so I can’t wait to get in there. McGregor’s promoter and manager, Barry McGuigan, hasn’t been slow in complimenting the former Scottish and British amateur champion since taking him under his wing last August, and he believes McGregor has all the attributes to make it right to the very top. “Essomba and his manager think this fight is too soon for me but this is my chance to prove to everyone otherwise,” McGregor said. “The fight is live on Channel 5 so I want to show that I am at this level already. I know I’ll have that opportunity to show what I’m made of on Saturday. Away from the ring things are coming together for McGregor and girlfriend Amber. The couple have recently moved into footballer and childhood friend Jason Cummings’ flat while the former Hibs striker plies his trade for Peterborough United in Sky Bet League One. “Everything’s good on that front,” McGregor revealed. “Amber is due in four weeks so it’s not long now. I’ve got that extra focus that my wee girl is on the way so I’m really looking forward to spending time with her once the fight’s out of the way. Her wee room is all done. It’s been quite emotional looking at it.